From 1820 the Southern Cheyenne occupied the lands between the North Platte river in Nebraska and the Arkansas River in Kansas.Many of the war societies had camps and families along these major rivers. These river paths soon became stage routes with Army forts springing up to along the trails leading to the West. Gold miner enthusiasts and settlers soon travel the route and disturbed Cheyenne villages and the sacred buffalo hunting grounds. There began to be more encounters and skirmishes with the white people from the east. Many a time Chiefs such as Lean Bear, White Antelope and other headmen would meet government agents to have peace, but to no avail. The agents seem to never understand the words of honor of the Chiefs. 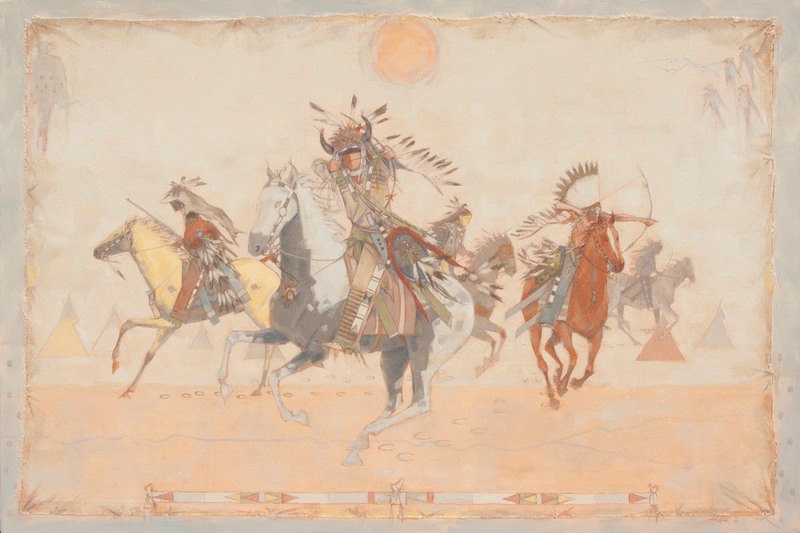 My depiction is one of several instances in the Fort Larned area where a few Cheyenne bands camped on the Smokey Hill River. Prior to Hancock’s war in the spring of 1867 the Cheyenne were cautious about letting troops get too close the the villages. They remembered the Sand Creek Massacre of 1864. In my painting the tipis are a montage of Cheyenne villages far off in the hills. The warriors are riding at a full gallop and are prepared to protect their people against the Blue Coats. During that time period each individual warrior had his own medicine deriving from his visions and dreams as a younger man. Head gear and shields were prepared and blessed by holy men as they rode off into battle. Their horses were also painted up in a medicine color which emulated great power. The Eagle sits in the left corner, medicine of lightning zig zagging from his claws. To the right are a set of Kingfishers, the ultimate warrior bird protectors. They are also throwing their medicine power upon the war party. The blue line below the horse hooves represents Smokey Hill River, running east to west. The warriors are engaging the Blue Coats under the warm sun of Spring 1867.